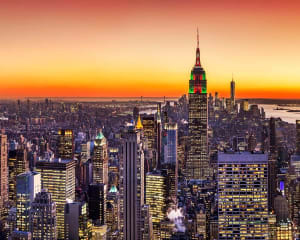 Enjoy views of the Big Apple in first class style, while sitting in the passenger seat of a helicopter high above the city's magnificent skyline. Cruise by all the city's hot spots and landmarks. Buy Now & You Save! 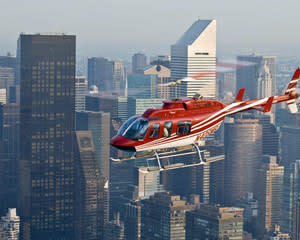 Taking an NYC Helicopter Ride: Where to Fly and What to See! This is a city with nearly 275 skyscrapers and 28,000 acres of parkland. And while no single tour would ever promise that “you’ll see it all,” a New York helicopter tour, without question, gives you the best lay of the land. The thing is, with so much to see on a chopper ride, it’s easy to get overwhelmed by all the eye candy (not to mention, the mere act of being in a helicopter elevates the senses)! To ensure you don’t miss a thing, we’ve broken down many of the highlights you can expect on your adventure. The Big Apple has numerous skyways available to you. Yet whichever flightpath you choose, the highlight of your adventure will likely be The Empire State Building, One World Trade Center, Lady Liberty, or Fredrick Law Olmsted’s chef-d'oeuvre, Central Park. 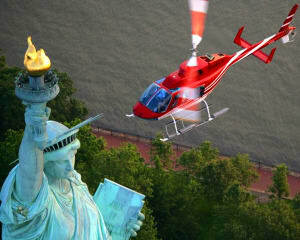 Thankfully, each one of our NYC helicopter rides features these landmarks. Flights provide 15, 20, or 30 minutes of sky time. The 15- and 20-minute jaunts mostly put the focus on downtown Manhattan while 30-minute helicopter rides of NYC take you south past Governor’s Island, giving you clear views of Brooklyn. If you’re a shutterbug, any one of these flights will do. Though, it’s worth mentioning that the 30-minute tour travels a little deeper into midtown Manhattan, giving you additional architectural photo opportunities. It’s also the ride that showcases three of the city’s most famous bridges. If you’re interested in capturing these feats of engineering, the 30-minute helicopter ride is likely the trip for you. As for shooting the skyline, all three NYC helicopter tours spend time along the Hudson giving you the panoramic vistas you want! Chances are, you’ll be flying in an EC 130. Sometimes called the ECOSTAR, this three-blade chopper accommodates up to six passengers and is unique in that it allows two to ride next to the pilot in the cockpit. The design is a darling among aerial photographers. It features a full-glass cockpit and incredibly large windows throughout the cabin. The spacious design also boasts an anti-torque device at the tail rotor reducing airflow blockage. This means a smoother, quieter ride for everyone on board. Downtown Manhattan: What Do You See On a 15-minute Tour? With your heliport situated just a hop, skip, and a jump from the Brooklyn Bridge, you know your tour is off to a good start. At around 900 feet, you’ll swoop over the world’s first steel-wire suspension bridge. The structure, spanning more than a quarter mile, astounds with its 275-feet towers built in limestone and granite. It’s a stunning exemplar of neo-gothic architecture. After looping the bridge, you’ll continue to Governor’s Island. Here, your pilot will descend slightly in altitude to provide you with views of Castle Williams that sits in red sandstone at the northwest point. You’ll also be within eyeshot of Liggett Hall and a number of 19th-century Greek Revival homes. No NYC helicopter ride would be complete without overhead views of the Statue of Liberty. The copper lady is a prime example of why you’ll want to think long and hard about when you want to fly. During the day, you’ll get an excellent look at the finer details and even get to wave and the friendly folks lunching in her crown. But at night, from this vantage point, this site is something else entirely. Guarding the skyline, Lady Liberty is all the more impressive under the glow of powerful spotlights. She’s a sight to behold. Your chopper continues over Ellis Island where the beaux-arts-style Museum of Immigration and Ellis Island Hospital dazzle with their red brick and limestone. While only 27 acres, the Island leaves a powerful impression thanks to its rich history. Continue north along the Hudson to the Upper West Side. Well over 1,000 feet above ground, your helicopter gives you the rare opportunity to see Central Park’s entire 842.6 acres at once. Strawberry Fields, Delacorte Theater, Cleopatra’s Needle—everything unveils itself to you in one sweeping vista. Again, you’ll want to consider your day-tour/night-tour options; to fully appreciate the views, fly when the sun’s still up! We needn’t remind you to “keep your eyes peeled” for the most recognizable building in the world. But be sure to appreciate some of the Empire State Building’s details that aren’t so apparent from photographs or street-level views. For instance, the pinnacle. Unless you’re up close, it’s hard to appreciate the scale of the spire, which is 203 feet tall. Also, note how its famous art deco style becomes even more pronounced at the building’s top stories. You’ll fly over Chelsea Piers and move in closer to One World Trade Center, the tallest building in the western hemisphere. The eight isosceles triangles making up the building’s surface are even more dramatic from these heights. And don’t forget to capture a shot of the twin memorial pools and their surrounding greenery, equally impressive from this altitude. What Do You See on a 20-minute NYC Helicopter Ride? The university buildings are prime examples of the City Beautiful movement. Born in the latter half of the 19th century, the architectural philosophy marries monumental classicism with urban modernity. From above, the idealistic structures make for wonderful camera fodder. 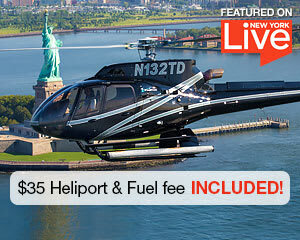 If you book strategically, you may be able to coordinate your helicopter flight with a Yankee game. It’s an absolute joy to fly over the famous stadium when it's packed with tens of thousands of spectators! The northern stretch of your helicopter flight crescendos with a circling over the George Washington Bridge. Connecting Washington Heights to Fort Lee in New Jersey, the double-decked bridge spans 4,7600 feet over the Hudson. 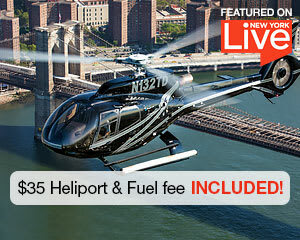 What Do You See on a 30-minute NYC Helicopter Ride? With 30 minutes of flight time, you’ll travel even deeper into Midtown Manhattan and further south for excellent views of Brooklyn. The circular structure contrasts the symmetry of its surrounding towers. From this vantage point, you’ll also get excellent views of the James A. Farley Post Office with its impressive Corinthian colonnade. Engineered using more than three times the metal needed to construct the Empire State Building, the Verrazano Bridge connects the boroughs of Brooklyn and Staten Island over the Narrows. It stretches out more than 2.5 miles and feature suspension towers that stand nearly 650 feet above the surface. 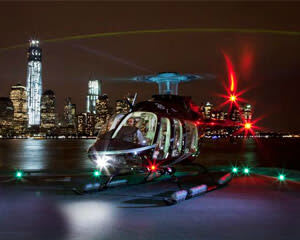 When’s the Best Time to Take an NYC Helicopter Ride? We’ve alluded to the fact that day and night tours both have their pros and cons (i.e. observing the Statue of Liberty after dark means missing out on some of Central Park’s scenery). Often times, a sunset tour will give you the best of both worlds. You’ll get to appreciate New York’s finer details (painted in a golden hue, of course) and then be dazzled by the illuminated skyline as the sun dips below the horizon. Indeed, sunrise tours offer their own brand of magic. Seeing the Capital of the World come to life from 1,500 feet lets you fully appreciate its grandeur. Of course, you’ll also want to consider the time of year you’re booking. Don’t underestimate the beauty of the snowy season. The white blanket draping the Big Apple offers rather unique photo opportunities. Not to mention, sunset tours during the holidays showcases millions upon millions of X-Mas lights strung up all over town. Come fall, Central Park is arguably at its most picturesque. Sure, you can take it all in with an autumn stroll, but a helicopter flight lets you view the full palette of oranges, magentas, and pinks against a towering concrete backdrop. The contrast makes the colors all the more vivid. Summer is obviously a surefire bet: sunny days, clear skies, greenest greenspaces. It’s your opportunity to see the city in full bloom. Springtime, too, has its advantages. The views don’t differ drastically from summer’s but, because flights don’t sell out as quickly, it should be easier for you to find the exact tour you’re looking for—particularly if you’re booking for a bigger group. Explore a Different Side of New York City! Even if this is your first time visiting, you’ll notice that New York has a familiar feeling to it. It’s the most photographed, filmed, and talked about city in the world. And that’s what’s so interesting about a helicopter tour of NYC. Seeing its famous landmarks from such unique vantage points shines a new light on everything. It all feels fresh and undiscovered. Sure, you’ve encountered aerial photos of the Big Apple before, but trust us when we say that being up there yourself reveals a side of the city you’ve never seen.